Once a small farming community, Hanford and the surrounding area of the Tri Cities (made up of the three cities of Richland, Kennewick, and Pasco, WA) was transformed during the Second World War when it became the site of the Manhattan Project's plutonium production facility. The Hanford nuclear complex continued to contribute to national defense by producing plutonium throughout the Cold War and formed a cornerstone of the local economy, even as the environmental cost built up throughout the region. In recent years, Hanford has been the site of an extensive clean-up effort undertaken by the U.S. Department of Energy in agreement with the U.S. Environmental Protection Agency and the Washington State Department of Ecology. This conference will focus on the history of the Hanford nuclear production facilities and the site’s impact on the Tri Cities area. We expect papers on such topics as: the environmental legacies of nuclear materials production; the politics of science, national security, and the state; atomic diplomacy and the Cold War; memory and public history at atomic sites (including the new Manhattan Project National Historical Park, one location of which is at the conference site); and the Manhattan Project in popular culture. 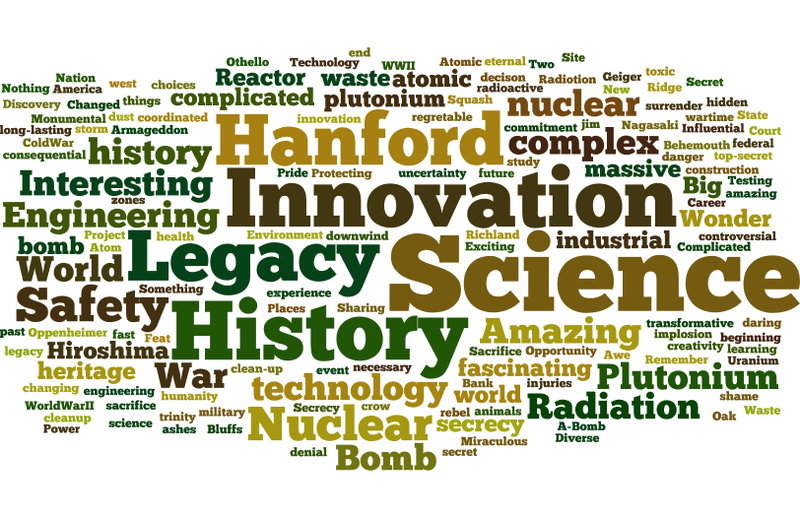 The conference will also mark the opening of the Hanford History Project archives to in-person researchers, making available the U.S. DOE “Hanford Collection,” which includes primary documents, photos, films, and digital materials. We will also have several events open to the public, including a reception Wednesday evening, a banquet Friday evening, and a Saturday evening benefit screening of the 2016 documentary Command and Control. Please join us for a unique opportunity to discuss history where it was made! During the registration process, attendees were asked to "share three words that come to mind when you think of the Manhattan Project." This is the results displayed in a Wordle.